Oct. 27, 2017 4:23 p.m.
Garry Cassidy feels like he lost 37 loved ones in a devastating fire in the early morning hours of Oct. 25. 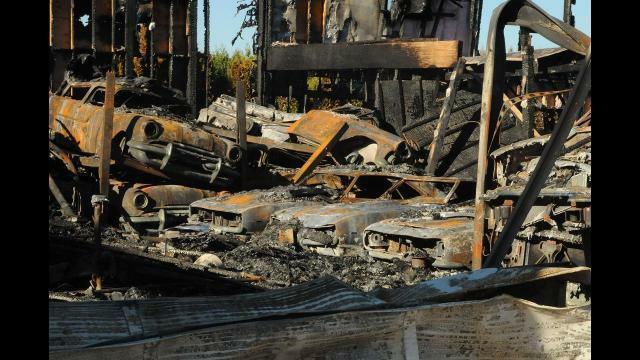 The Milner resident was in Palm Springs when he found out that his 10,000-square-foot shop went up in flames, and inside of it, 37 classic and rare vehicles were completely charred. It took Cassidy 17 years to collect the vehicles. The fire happened on Cassidy’s property along the 7200 block of 216 Avenue in the early hours of Wednesday morning. “We got a phone call at 3:39 on Wednesday morning,” Cassidy told the Times as he stood in front of the burned remains of his car collection. On the other line was a representative from the security company, who told Cassidy that there was a break-in and a fire alarm and that RCMP and the fire department had been called. “And we went, ‘Oh my God, this can’t be good,’” Cassidy shared. Five minutes later, a friend of the couple went to the shop and then called them with the bad news. “He phoned me and said, “It’s not good,’” Cassidy said. The oldest car on the shop was a 1931 Ford two-door sedan; his prized possession was a one-of-a-kind 1961 Bel Air convertible. “Most of my cars were General Motors products,” Cassidy said. The cars and the shop are insured, but the emotional damage has taken a toll on Cassidy. His voice cracking, Cassidy pointed to what was left of one of the cars. “A million dollars wouldn’t replace that car because it’s the only one on the world. A previous version of this story incorrectly reported the size of the shop.